JT – Off-season news surrounding Formula 1 often borders on the ridiculous. Liberty Media’s recent announcement that F1 will no longer feature grid girls is a good example. Apart from what seems to be a move aimed at bowing to political correctness, one has to wonder why Liberty made it a point to announce the shift? With all of the challenges currently facing F1, shouldn’t their priorities be focused elsewhere? That would be something worth talking about. As it is, that will never happen so here we are talking about grid girls. I feel sorry for the girls, as I think virtually every one of them thought it was an exciting job that got them to travel to places and maybe meet people they would never normally meet in their normal daily routine and I don’t think anyone of them felt anything but happy and positive about doing it. But as always in these matters, it’s the small minority that makes the most noise that seems to be heard the most and as such no one wants to offend them, and here we are. Frankly I don’t think the large majority of race fans around the world, including myself, could care less either way. This is the equivalent to a restaurant making an announcement they’re changing the color on their menu, but the food will still be the same, hardly newsworthy. JT – McLaren boss Zak Brown recently said that he’d like to F1 to resolve matters around its rules for 2021 by the middle of this season to avoid the series being damaged. He added that the longer negotiations about the rules and a likely $150 million cost cap go on, the more “turbulent” and more “disruptive” they could be. Brown also said teams would need to know what 2021 rules would look soon to allow them time to prepare or the date for implementation could slip a year or more. In the short to mid-term it looks like F1 is stuck with its current unpopular formula with Mercedes retaining a long standing advantage. What are your thoughts on this? SJ – Historically, the longer the same formula stays in place – as I’ve been saying for years – the grids will tighten up and the costs will eventually go down. The tradeoff between throwing money at R&D and the gain you get is getting smaller and smaller by each year. That typically allows the smaller, less funded teams to catch up a bit. The big teams will always find ways to spend money of course but at least their gains in performance will be diminished some with every year that goes by. Rule stability is always the best way to keep the costs down and the grids close, once they find the right formula, which is the hard part. The racing is not going to get any better with the current cars. We know that. People will get closer to Mercedes for sure, we already saw that last year, but that doesn’t mean that the racing will be any better. It’s just the nature of the high downforce cars we have now. The level of sophistication that many race cars have - not just in F1, in the WEC and other formulas too - the level of simulation, preparation and information the engineers have at their disposal, you lose almost every element of unpredictability. And that’s typically what makes the racing interesting and exciting most of the time. I keep coming back to IndyCar, I think they have the competition formula about as good as you can make it. On the day, someone who gets the critical things right and plays the strategy game well can still win. That’s impossible for anyone outside the top tier in F1 unless there’s a sudden rain shower, a big accident at the first corner or something really unusual happens. There’s very little possibility that you’re going to get a surprising result. You almost know what the result will be before the start of a race or after the first corner. JT – Interesting things are happening in IndyCar, including pre-season testing at Phoenix where Scott Dixon ran the series’ version of cockpit protection – the aeroscreen. Apparently Scott thinks it has potential. SJ –Yes, it seems promising although it still may require some more work before they are comfortable to race it. It certainly looks like a much more visually appealing solution than the Halo. But as with all of these things and whatever option will be chosen, two races in we’re going to get used to whatever they choose and then that will be the norm going forward. All the drivers moaned when the Hans Device came out, including me. It was uncomfortable and restricted your movement but after a race or two you got used to it and didn’t really think about it anymore. The fact that these are cockpit protection devices for the sake of safety, and may save someone’s life– there is no turning back, so we might as well get used to the new look of the cars, although it really does ruin the esthetics of the cars. JT – There has been a lot of talk about the universal aerokit that IndyCars will run this year. Interestingly, the comments haven’t been uniform with some drivers saying the new lower downforce body makes the cars more much difficult to drive over a stint. Others have said there isn’t too much change from the previous cars, at least on road courses. It will be interesting to see the comparative level of comfort different drivers and teams have with the new cars. SJ – I think it’s going to be a good thing overall. It’s a good step in the right direction both for the racing and other considerations. 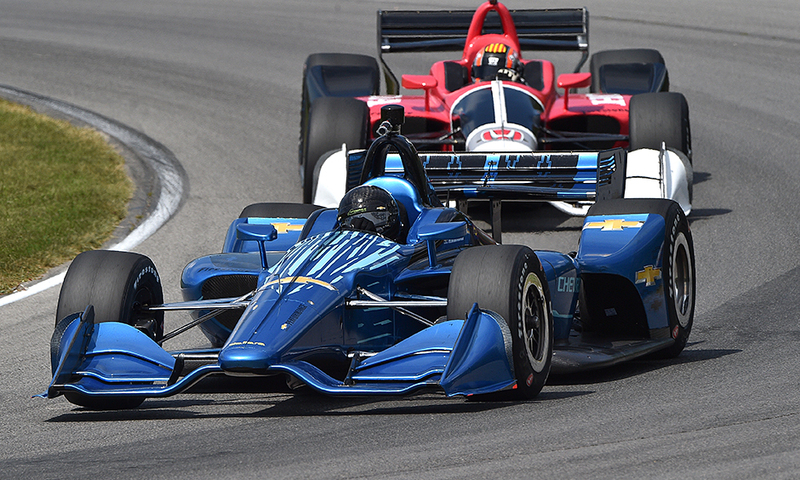 The cars look great too, like proper open wheel race cars instead of the previous cars that looked like a barn door coming down the road. I think it will separate the field more than before and all indications are that it requires a lot more from the drivers than the previous high down force cars did. JT – Looking around the racing world as the off-season begins to wrap up, it still looks – with few exceptions – as if it’s not easy to find money to race. We see struggles throughout professional racing. As you’ve pointed out repeatedly, sponsorship in Formula One is a shadow of what it used to be. Racing has always relied on various forms of patronage but it seems as if that’s more the case today than ever. Do you agree? SJ – Racing has never really existed without patronage, it has always been the same. The biggest difference today is the sheer cost of competing at almost every level. It’s so much higher mostly due to the technology being used on the cars and how much it costs to run them, and because of the advanced electronics and all the data required the number of people you need to run them competitively has increased dramatically. Even at the most basic level you still require 2-3 times the amount of people you used to. Payroll is always the biggest line item in the budget and if you want to win you have to hire the best people you can get, and they are not cheap. Sponsorship is probably at the same level it’s been for a while except in F1 where teams seems to depend more and more on the money they receive from FOM, but the cost of running the cars is much higher, which means there is nothing left over to hire the best drivers you can get, except for the factory teams. This is a big part of why more and more teams have to rely on drivers bringing a budget of some kind to the teams and a lot of really good professional drivers are unemployed. Sportscar racing today is probably worse dollar for dollar than it was in the 80’s even. Apart from the really top guys in factory teams the driver salaries are lower than I can ever remember. In Formula 1 especially, it’s purely a matter of cubic dollars, the more you spend the faster you will go. You could argue today, that unless a team is in a position to win races or the world championship, like Mercedes, Ferrari and Red Bull they might actually be better off hiring a paying driver that brings a substantial budget as they will most likely get more overall performance from that than a slightly faster driver they have to pay to drive. This is the reality today. JT – We’ve spoken about it a bit before but do you see a cost spiral problem for Formula E? SJ – It’s a bit different there I think. My guess is they’ll be able to keep a fairly good handle on costs because there’s so little you can do to the cars in Formula E. One of the few things you can touch on the chassi is the damping. The aerodynamics are frozen, the batteries are frozen, the brakes are frozen. You can work on the gearbox and the drivetrain. That’s where money will be spent. But in comparative terms, what can you do with an electric motor? Not an awful lot to gain performance, most of it comes from the battery. You can work on software and weight. Formula E should be able to control the costs if they’re strong from the start and every indication so far is that they’re actually doing a really good job in that area. They’ve been quite tough on some of the big teams also, so I think everybody already know there’s a big risk in trying to bend the rules and running the risk of getting thrown out if the car does not comply with the rules. We’ve already seen it happen. This has always been one of the problem with Formula 1. Because the formula is comparatively open in as much as that the teams are not restricted to a frozen package on all the key components, the rules are always open to interpretation. The teams spend massive time and energy reading the rules over and over to find a loophole that’s open for interpretation. There then do not seem to be the strength to keep a handle on the rules until it’s generally too late. So whenever someone comes up with something that’s marginal as far as the rules go, they let them get away with it instead of shutting it down right away, and then everyone eventually has to follow as and when they figure out what’s been done. At a huge cost to each team most of the time. How many times has F1 reset aerodynamic rules? Remember when the cars had aerodynamic devices everywhere? That wasn’t too long ago. Then they banned all of that. Now they’re almost back to where they were. How did that happen? They basically found ways around the rules and no one stopped them. NASCAR seems really good in that regard because if someone steps out of line they just say “no, not allowed, end of story.” They ban whatever the thing is before everyone gets too carried away. JT – You were on hand for the Formula E race in Santiago, Chile. The Teecheetahs of Jean-Eric Vergne and Andre’ Lotterer battled hard for the lead with Vergne winning. Felix Rosenqvist came into the weekend leading the championship after two wins from the first four races of the 2017/18 season but lost the lead to Jean-Eric Vergne. He seems to be enjoying FE. SJ – Felix is loving it, definitely. The race format has become very interesting. It’s not an easy category and it’s a very intense day of racing. The races are short and you’ve got to literally get everything right in one day, from qualifying to racing. So if you’re off the pace at all it’s tough. It’s become very competitive with great drivers and engineers in every team. Felix did a great job in the race to recover to 4th from 14th on the grid, and the team did a blistering fast driver change which gained him some positions also. JT – How was the racing received in Santiago? SJ – It was positive and negative because apparently the track was laid out over three different municipalities in the city. Two of them were very happy to have the race there and one was very negative. So there was some vocal criticism but I think the promoters did a good job overall. The track was bumpy but it was a nice layout and the race was good. Overall, it was good and there’s no doubt that FE has some very good momentum at the moment. JT – Prior to Santiago, you were down in Daytona for the Rolex 24. The race was a star-studded affair this year and the crowd was reportedly very good. There was some hard racing and some attrition but surprisingly few caution periods. The Cadillac DPis of Action Express were the class of the prototype field while the Ganassi Ford GTs dominated GTLM. Scott Dixon came home with another Rolex 24 win. What did you think of Daytona this year? SJ – Daytona was good, no doubt. The formula that IMSA has come up with for DPi/P2 is working well. The Dpi’s seemed to have an edge but the racing was good. Overall, it was a big grid and there was definitely a lot of interest. Alonso being there didn’t hurt. There was a good feeling from the whole thing. Scott and his co drivers did a phenomenal job all race, although they had to use some clever strategy towards the end in order to get in front of their sister car and win their class. Both the team and all six drivers did a superb job and no one put a foot wrong for the entire race. There were the usual complaints about BoP and how you control it but you’re always going to have the same problems with it. There’s only ever one team that’s happy, whomever is on top of the podium, the rest always think they’ve been screwed. I keep coming back to my argument that the GTLM cars are so good today that if you unrestricted them, it would be enough. You wouldn’t need the prototypes anymore. If you took the restrictors off all of the GTs and had every manufacturer build a proper car instead of relying on BoP to make them competitive, they could be going at least 10 seconds per lap quicker. Just unleash the GTs and they’d be flying. JT – You’re in the process of writing another treatise on the state of racing currently and what you think could be done to restore it to better health for the future. Last year, you did that in column form for Racer Magazine and it was very well received. In a nutshell, what will you be adding this year? SJ – It’s really a philosophical way of looking at the cars and the future of racing based on my thoughts and conversations I’ve had recently with several designers/engineers and drivers. There are five tenets basically. First, you minimize downforce so that the cars are drive-able, but no more than that. I’m guessing 60 to 70 percent less downforce than we see on a F1 car today. Second, increase power by 200 to 300 horsepower. Third, weight. That’s the biggest issue for me and why there’s no focus on weight I can’t understand – on track or on the road - in terms of energy usage. Weight should be the prime target for efficiency, not batteries or most of the other things being pushed now. We keep adding weight to vehicles, and how does that affect efficiency? We all know that’s a problem – both with race cars and street cars. Hypothetically, if you could cut the weight of every car on the road or track in half, can you imagine how much that would increase efficiency and reduce environmental impact? Four, you define an energy allocation allowed for any race car. A car is allowed ‘X’ amount of energy consumption whether it’s powered by gasoline, diesel, hydrogen, electric power - whatever it is – for the duration of a race distance. There must be a formula that can be worked out combining energy consumption and thermal efficiency. Then you can quickly determine which combination works best. Five, free up tire technology. You could immediately gain as much as 5 seconds per lap if the tire companies were allowed to build the best tire they can. I can see at least four tire companies that would be interested right away if the rules were open for anyone to compete and use whatever size tire they prefer. That would mean we would never see these silly looking balloon tires again, that were last seen even on a roadcar sometime in the 70’s! Put all of this together and the lap times cars run would run would very soon be quicker than they are now, it’ll just be achieved in a different way, and they’ll be spectacular to watch. They’d be faster on the straights with acceleration that would be mind-boggling. Braking distances would probably be 100 yards longer than they are now with the lower downforce. Cornering speeds lost by the lack of downforce would be partially returned by the added tire grip and less weight. That would promote overtaking and the drivers would have to work very hard to make the cars go fast. Ideally, there should be four areas of almost equal importance to the overall performance of the car, Chassi (including Aero), Engine, Tires and Driver. As it is today, Aero have by far too much importance, followed by the engine, then the tires and finally the driver. And of course, the other point behind this is to save money and cut the cost of racing, by restricting areas of development where damaging amounts of money are being spent now for no reason, and emphasize other areas – like tire grip. There’s a huge amount of time and efficiency to be gained there and a tremendous amount of money to be saved for the teams. There’s more to all of this, including my thoughts on race tracks, and I will elaborate a lot more on each topic.